Tell Me One More Story Journals can be completed by a parent for an adult child. The questions will help mom and dad recall the stories of their son or daughter's childhood. Give it to your parents empty, or write in it for your own grown-up boy or girl. For more product details, click on title. For more product details, click on the title. Remember your childhood? Of course you do. Your parents remember even more, and what would THEY say if asked? This journal was created for parents to record the heart-warming and hair-raising tales of raising a son or daughter. Record the interesting, funny, touching, perceptive and innocent things your child says. Save energy + eat great treats = win-win! Make these doubly delicious treats with a surprise in every bite. Trying to eat carefully, but REALLY need a treat? For more product details, click the title. Easy recipes and clever put-togethers to say "Thank You!" This is the original Sisters journal created in the style of the Memory-A-Day Series. There is room to include more stories for the avid writer who desires to create a very sentimental keepsake for her sister. Pre-readers (ages 4 - 6) are encouraged to write OR draw in this journal. Each page has an age-appropriate story-starter for the young author. Journal was written & designed by experienced Kindergarten teacher. A fun journal for beginning writers, each page has an age-appropriate story-starter for the young author. Especially for ages 6 - 8, children are encouraged to express themselves writing in their own way. Journal was written & designed by experienced elementary teachers. This journal for ages 9 and older has questions and story-starters to help the young writer express feelings and tell his/her stories. 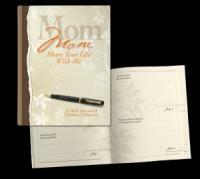 Give to your Mom to fill in for you, or write your memories as a gift to your children. 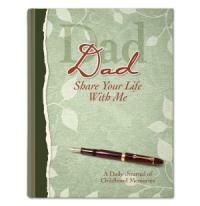 Give to your Dad to fill in for you, or write your memories as a gift to your children. Give to your Mom to fill in for you, or write your memories as a gift to your children. This book has the same content as the spiral Mom Share journal, but is a bound hard-cover book made of different materials and design. Give to your Dad to fill in for you, or write your memories as a gift to your children. This book has the same content as the spiral Dad Share journal, but is a bound hard-cover book made of different materials and design. Give to a Grandma to fill in for you, or write YOUR memories as a gift to YOUR special grandchild. 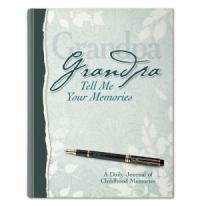 Give to a Grandpa to fill in for you, or write YOUR memories as a gift to YOUR special grandchild. This book has the same content as the spiral Grandma Tell Me journal, but is a bound hard-cover book made with different materials and design. This book has the same content as the spiral Grandpa Tell Me journal, but is a bound hard-cover book made with different materials and design.